So yesterday Microsoft unveiled their next gen console to mediocre fanfare… Seriously the whole thing was extremely underwhelming. Now I couldn’t care less about consoles and which one is better, because really it all comes down to the games. AND BOY HOWDY DID YOU SEE THAT NEW CALLS OF DOODY! IT”S GOT A DOG! Do you guys like Bravest Warriors? Have some Bravest Warriors art I drew up this weekend. Yeup, looks like I’m STILL not throwing money into this generation of consoles. I’d rather spend the money funding Starbound or a Kickstarter game that looks promising. There is nothing a console can do that a PC can’t, and a PC can surpass them in many ways. Then again, I was tired of FPS games around the time of Halo 2. One more CoD game is just another coaster to me – I wouldn’t play it if someone gave it to me. I haven’t had the real desire to own a console since the PS2 – and even then it wasn’t worth it once they removed the HDD option. Painkiller got more content… that was nice. have triple A games become this predictable? The reveal was just weird on all accounts, but i find it more funny that after the reveal of the Xbox One, Nintendo AND Sony’s stocks both rose in price. Also i’ll safely take that bet as well. there is no way they would add in something for you to build a emotional bond with if they wern’t just going to kill it off. Counter bet-5 bucks that will be the only addition to the game at all in terms of what is different to last year’s CoD. Ha! I’d never take that bet. Yeah, anyone who’s excited, I’d have to ask what, exactly, they’re excited about. Voice commands? Yeah… every TV has that… unless you still use cable or some such. People don’t… they don’t still do that, do they? I’m waiting for E3 and seeing what games they bring, Games ultimately make the system. 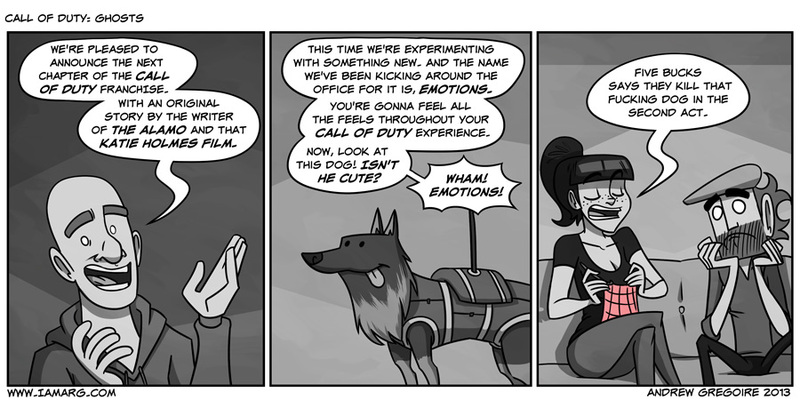 I don’t think the dog will survive the game and they will make you feel a lot of feelings when it dies. That being said, still not going bother with it. Their ripping off Ghost Recon Future Soldier in the next one. I know you’re Candian, all the more reason for talking properly. Or is your complaint directed elsewhere…? I’ve barely got to grips with my 360, and now it’s all change again! Man, I feel old! If anything, anything at all, could kill my interest in console gaming… it would be the XBox “One”. I mean that… yeah. Severely underwhelming. I don’t even watch TV hardly anymore. I just use Netflix. Also… they’re going to be watching you through the Kinect to see if you cry for the dog when it dies. If you do, achievement get. This is a thing that is now real. You like bravest warriors too???? I bet the dog dies in the 1st act Lynn.